We are solving series of problems based on the concept of oscillation and simple harmonic motion. If the acceleration of a body is directly proportional to the displacement and opposite to it, then the motion is said to be simple harmonic motion. This can be done by many type of systems and if they are obeying the above mentioned condition, we can get the time period or frequency and it is constant all over the oscillatory motion. A loaded spring do oscillate when it is slightly disturbed. In practical way, any body won’t continue its oscillatory motion for ever and and due to air resistance, it slowly decreases and finally comes to the state of the rest. This kind of motion is called damped oscillatory motion and it that has to be continued, it shall have some external force support and that kind of motion is called forced oscillation. 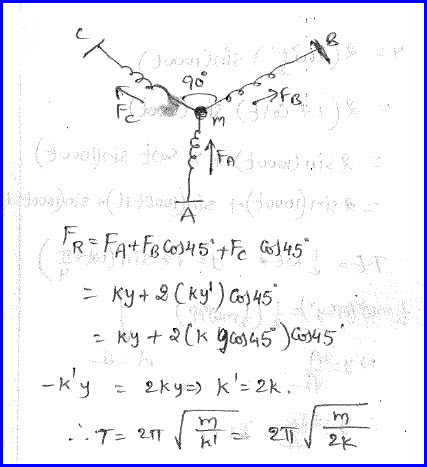 We need to find the time period of pendulum of infinite length and the problem is as shown in the diagram below. We need to write the equation for the torque as the product of force and perpendicular distance. Force is nothing but the weight of the body and distance is found as shown in the diagram below. 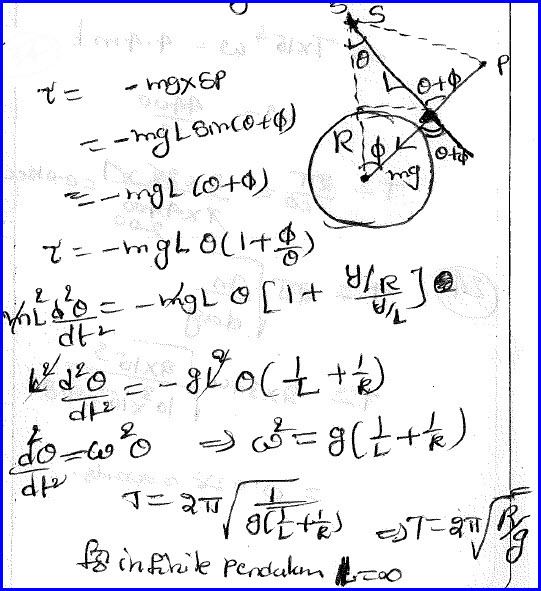 We need to write further torque as the product of moment of inertia and angular acceleration basing on its definition. Thus we can equation for the acceleration and hence the time period as shown in the diagram below. 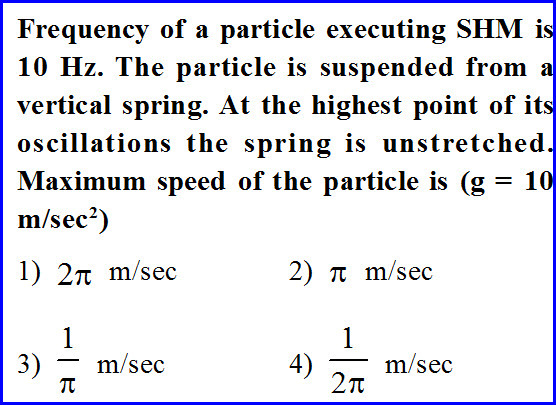 Frequency of a particle in SHM is given to us as shown below. We need to find the maximum speed that the particle can reach in the oscillatory motion. The restoring force acting on the spring is nothing but the weight of the body and hence we can find the maximum possible displacement by equating them. 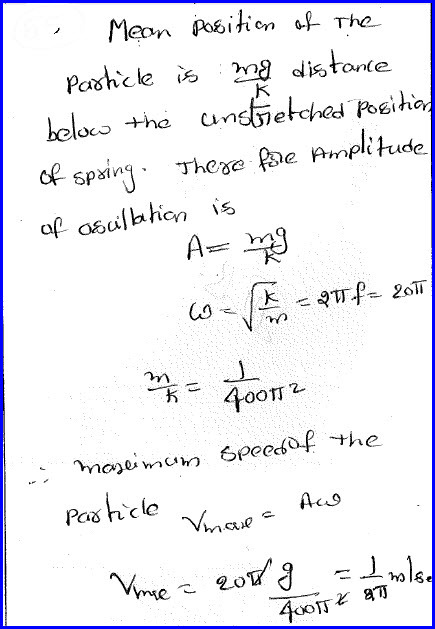 By comparing that with the standard equation, we can find angular velocity and hence the maximum speed of the particle as shown in the diagram below. 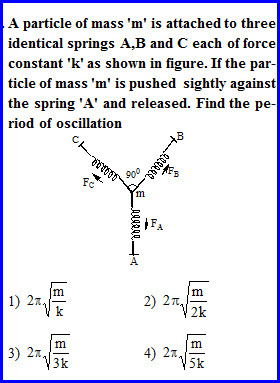 A particle of known mass is attached to three springs as shown in the diagram below. If the particle is slightly disturbed, we need to know the time period of the system. 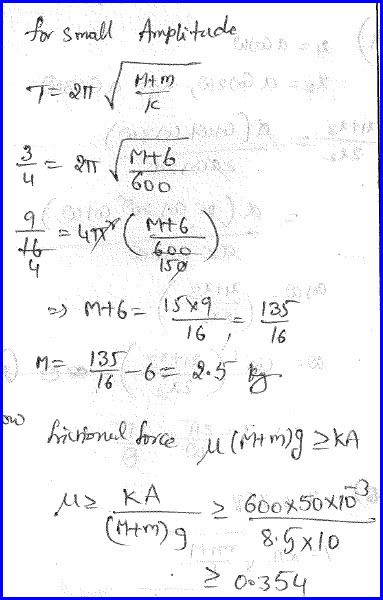 The resultant force acting on the mass using the vector laws of addition. We need to resolve the force into components and add as shown in the diagram below. By equating it to the restoring force, we can write the equation for the time period as shown in the diagram below. Two blocks are kept one over the other and the lower surface is smooth and the connecting surface is rough as shown in the diagram below. The system is connected to a rigid support with a spring and the time period of the system is given to us in the problem. 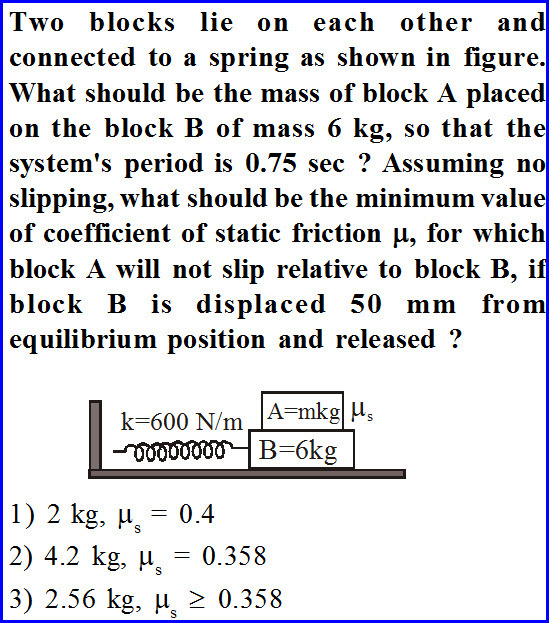 We need to find the mass of the upper block and the coefficient of friction so that there is no slipping between the two blocks. We know the equation for the time period of a loaded spring and using that data, we can find the mass of the upper body as shown in the diagram below. Further equating the frictional force to the restoring force, we can solve the problem as shown in the diagram below.